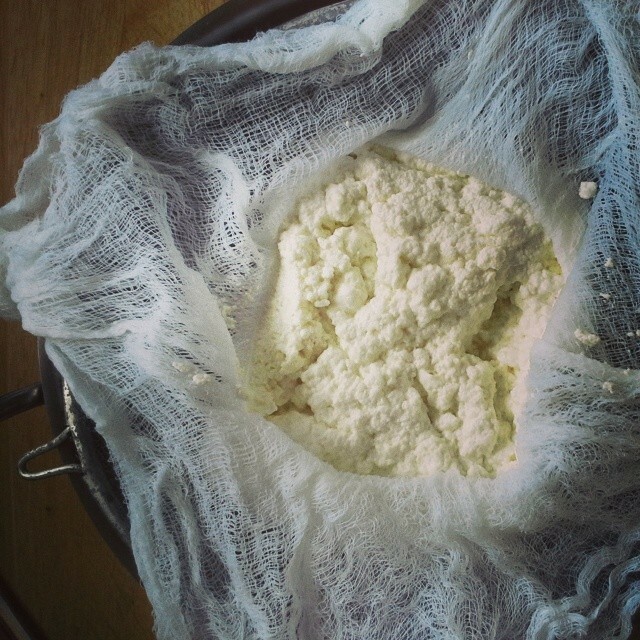 Queso fresco, or “fresh cheese” in Spanish, is a soft Mexican cheese that is traditionally made with raw goats milk or a combination of goat and cow milk. Pasteurized versions of this cheese can be found in many markets throughout the country. The flavor profile of the cheese is milky with a slight salty-sour undertone. The mild cheese is not “rich” in the traditional way, but because of its freshness, it can be creamy too. The texture can range from soft and wet to a drier, slightly firmer cheese. The applications are endless, from eating when freshly made smeared on a piece of toast and even crumbled on top of tacos and omelets. Queso fresco is a light, fresh cheese ideal for hot summer months and perfectly paired with grilled meats and vegetables because the subtle cheese provides a good contrast to rich foods. Making a basic queso fresco is easy and requires only three ingredients: milk, vinegar (acid), salt. Of course there are variations in milk, acid, seasonings and even herbs, but the recipe that follows is a basic one; how you dress it up is up to you. In this recipe you will heat your milk to about 200°F, and if you have a candy thermometer that will be easy. However, if you do not have a candy thermometer, simply keep in mind that the boiling point for water is 212°F. While milk and water have slightly different boiling points, just aim for those precious degrees before your milk hits a boil. A final note one curds: when you add the vinegar to your milk it will curdle, but that is how this cheese is made, so do not panic. Be careful when the curds are forming not to scrape the bottom of the pan because you may pick up bits of scalded milk. Before discarding the left over strained liquid, or whey, keep in mind that is full of protein and is high in certain vitamins and minerals. Athletes use it in protein shakes and dog owners often use it for homemade dog food as a good source of protein and fats. 1. In a large pot, bring the milk and salt up to 200°F over medium heat. This is about 10 degrees from boiling. Use a candy thermometer for better accuracy. 2.Meanwhile place 2-3 layers of cheese cloth in a sieve and set over a bowl. 3. Once at temperature, lower the heat to medium-low and add the vinegar. 4. Stir gently to encourage the separation of curds and whey. Do no scrape the bottom of the pan as you might pick up scalded milk. Add more vinegar a teaspoon at a time if your curds are not forming. 5. Once the curds have separated, remove from heat and carefully pour through your prepared sieve. Allow to sit for 10-15 minutes. 6. Once cool enough to handle, squeeze the sack of cheese to further drain the liquid. You will have a soft, creamy cheese. You can eat it as it or continue to the next step to remove more liquid, making it a firmer cheese. 7. Place the cheese (still in the cheese cloth) on a rimmed baking sheet. Place a plate on top and weigh it down with something like heavy canned goods. Place a rubber spatula under one side of the baking sheet so that the liquid that is pressed out will collect on the side opposite the spatula, allowing your cheese to dry a bit. 8. Place the cheese (still in the cheese cloth) it in a mold, or a bowl, to shape the cheese for serving. Allow the cheese to chill in your refrigerator, weighed down, for an hour, this will allow it to hold its shape. 9. Unmold your cheese to serve. Once last recommendation, a pint of half and half, or heavy cream gives it that little extra body to it. Keep up the good work! Thanks for the tips! We’ll let you know how our next batch turns out.